Mahogany Grille is The Strater Hotel's fine-dining restaurant and the place to enjoy handcrafted cuisine while stepping back in time. 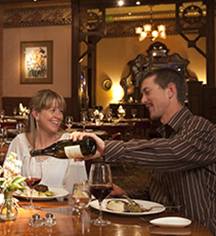 The restaurant offers the ambiance of the Victorian Old West as guests are served an array of eclectic culinary specialties. It’s the blending of the simple with the ornate—of the old with the new. Guests are invited to view the menu selections where they will find a diverse array of faire. When preparing the Mahogany Grille menu, the award-winning chefs give special focus to farm-fresh recipes that represent new styles with old west flavors. Steaks are hand-cut in the butcher shop, foods are carefully selected, and products by local growers are incorporated when available creating a mosaic of tastes and textures. This detailed attention to the region is a reflection of the commitment to the great Southwest and its history, exceptional quality, and pleasing the community and visitors. Mahogany Grille received OpenTable’s Diner’s Choice Award and was voted “Best Steakhouse in the Southwest”. 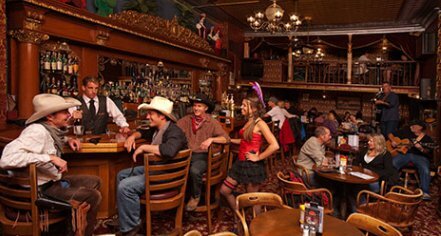 The Diamond Belle Saloon serves lunch and dinner daily and is one of the most famous original ragtime piano bars in the Wild West. Costumed bartenders and dance hall girls transport diners to the turn-of-the-last century and there is live music daily with world-famous ragtime piano players. Visit on Sundays for the Sunday Belle Brunch. Then to top it off, throughout the summer, three times per week, the Diamond Belle serves up a reenactment of an Old West gunfight! The “Belle” is a must see while in Durango. The Office Spiritorium is a Victorian-style social gathering place, offering fine wines, signature martinis and spirits, and coffee beverages in a smoke free environment, along with appetizers and light dinner entrees. Local musicians perform daily. The Office was voted “Best Happy Hour” bar by the locals. Come early, because seating goes quickly.